People ring in the new year in different ways all over the world. With the arrival of the first day of 2018 Michael Brant Demaria is releasing AMA. This is universal music for the masses to start the year off right. Where I sit on this day in the frigid Northeast, we are experiencing subzero temperatures. I am not letting the physical part of my existence dampen my spirits or resolve. I prefer to let the music take me away and give me a different perspective. 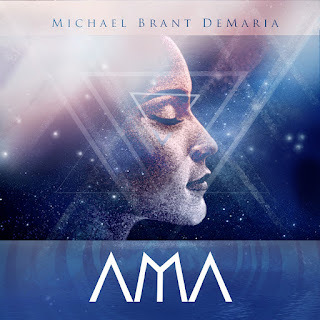 AMA is a beautifully mixed collaboration of sound, textures and spirituality. I found AMA a very relaxing and reflective journey. This is a wonderful tribute to Michael’s mother Jacqueline. Through his music I am sure his Mother’s journey was very special. He was able to give her some comfort and send her on the next journey into the realm of the spirit. For this fortunate artist, a unique and unforgettable experience allowed him to keep her spirit and memory alive for the days he has left on this earth - all through the tracks presented on this recording. Music is clearly a tool to help all the beings on our plane to traverse different layers of existence in spirit and physical dimensions. The essence of the music on AMA speaks well to that. The artistry and contributions made by Michael over the years are precious and for this listener, it initiates peace and gratitude for life and my surroundings. Through another’s discomfort, pain and or acceptance, something beautiful and eternal is created, another life and music that heals. There is so much more here besides a casual and relaxed listen, this is about life and death and being reborn. It is about the cycles we all go through as we get older. And more specifically, about becoming ready to come to terms with another life that lies ahead. AMA brings the light of hope and the promise of a new day.